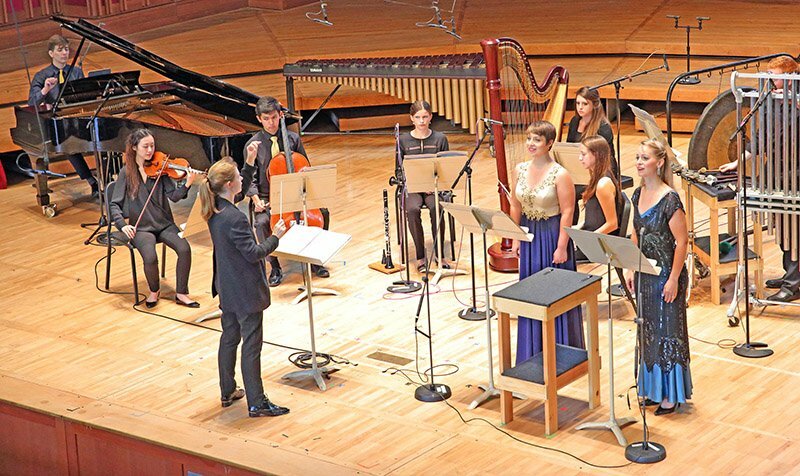 Tanglewood’s 2018 Festival of Contemporary Music, held this year from July 26th to 30th, brought together an astonishing array of music from the past few decades, including works by such “elders” as Witold Lutosławski and György Kurtág, as well as brand new compositions by younger composers. Best of all, performances by the Tanglewood Music Center Fellows and the TMC Orchestra and guests displayed the skill, hard work, and devotion of a group of talented musicians from around the country and around the world. This reviewer attended the concerts on July 28th, 29th , and 30th. A rousing fanfare for four horns by Mexican composer Javier Álvarez opened the Prelude Concert on Saturday afternoon. A champion of Latin American idioms, Álvarez is also known for his compositions combining electronic sounds with various instruments. His Trompatufarria al Pastor was composed in 2005 for the Mexican horn quartet Puro Corno headed by his friend Juanjo Pastor. 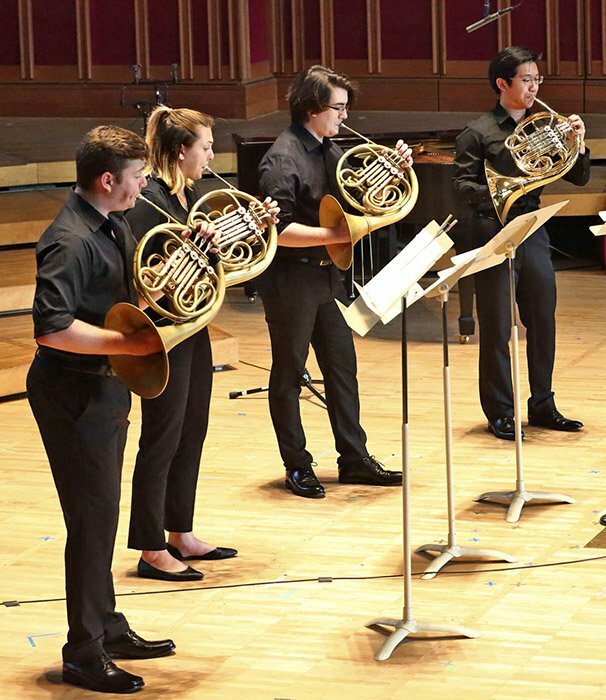 TMC fellows Harry Chiu Chin-Pong, Scott Leger, Alison Dresser, and Nicholas Auer showed off their technical prowess in this joyful piece, in which insistent repeated chords alternated with intricate counterpoint. The title of Gyögy Kurtág’s Életút/Lebenslauf (Course of Life) was a nod, according to Matthew Mendez’s notes, to a poem by the German romantic Friedrich Hölderlin. In this evocative piece from 1992, Kurtág played with sounds ancient and modern: two basset horns (a type of clarinet pitched a 4th lower than the B-flat instrument, famously employed by Mozart and thus a memory of a late 18th-century sound world) pitted against two grand pianos. The fragmentary opening line in the pianos was further blurred by their tuning a quarter-tone apart. The resulting weirdly shrill tones contrasted with hushed allusions in the basset horns to a Romanian Christmas carol, punctuated by fortissimo interjections. A long, wordless yet verbally allusive series of fragmentary memories followed. Coordination among the four players (pianists Tomoki Park and guest Michael Smith with Ryan Toher and Giovanni Bertoni on the basset horns) displayed a keen sensitivity to their shifting functions within this disparate sound world. Sam Shepherd and Andrew Norman, composers of the two final works, were both born in 1979. Shepherd, a former Tanglewood Composition Fellow, has described his 2011 Quartet for Oboe and Strings as inspired by the “subtle, intimate choreography “ of Mozart’s Oboe Quartet K. 379.Composed in four continuous sections, the first section, marked “Volatile,” opened with the oboe in charge, In the second, “Moto perpetuo,” the oboe’s incisive tones were matched by violin pizzicati, but with the tempo change to “Very slow” the oboe matched the mellifluous string tone and then outdid the strings in a virtuosic cadenza followed by an ethereal oboe-violin duet. The return to “Tempo primo” brought a lighthearted dance conclusion that was truly Mozartean in spirit. Andrew Norman’s Light Screens (2002) for flute and strings claimed a visual inspiration: the interplay of form and color in Frank Lloyd Wright’s stained glass windows for his prairie-style houses. Paralleling Wright’s varied repetition of basic forms, Norman used short instrumental motives in multiple contrapuntal and rhythmic guises, along with a wide variety of instrumental colors, including flutter tonguing in the flute and ethereal harmonics in the strings. TMC fellows Shannon Vandzura, flute, Carolyn Smes, violin, Johanna Nowik, viola, and Hana Cohon, cello, were more than equal to the complex technical demands of Norman’s piece. Stepping in to replace conducting fellow Yu An Chang, FCM Musical Director Thomas Adès opened Sunday morning’s concert with a performance of Irish composer Gerald Barry’s Sextet (1993) for bass clarinet, trumpet, two percussionists, piano, and double bass. After a long and arduous introductory trumpet solo, beautifully rendered by Federico Montes, a conversation ensued between trios: two marimbas (Jennifer Marasti and Ye Yoon) and piano (Nora Bartosik), and piano left hand, bass clarinet (Ben Quarles), and double bass (Gabriel Polinsky), winding up with a first tutti in a kind of ordered cacophony before returning to the conversational mode. New motives, canonic interplay between bass clarinet and trumpet, then piano and the two marimbas, and accelerating speed led to an intriguingly inconclusive ending. If all this sounds haphazard, it was not. Precise preparation of the interweaving parts by the performers, along with the verve and dynamism of Adès’s conducting style, added up to a convincing rendition of this complex piece. Based on the 1989 Ritual Fragment, Harrison Birtwistle composed his Cortège, A Ceremony for 14 Musicians (2007) to celebrate the reopening of the Royal Festival Hall. The virtuoso instrumentalists, arranged in a semicircle, are instructed to perform without conductor, each soloist stepping into center stage when cued by the previous player in a continuous peregrination of melody, either solo or duet, with a unison conclusion for the entire ensemble. In another kind of ritual, Niccolò Castiglioni set 24 epigrams from Der Cherubinischer Wandersmann by the mid-17th-century Counter-Reformation mystic poet Angelus Silesius in a two-part sequence titled Cantus planus (1990). Two high sopranos (Fotina Naumenko and Mary Bonhag) sang as paired cherubs, sometimes trading only two pitches, sometimes widely separated as tune and descant or competing in spectacular virtuosic hi-jinks. Seemingly inexhaustible, they wisely (and discreetly) monitored their pitch in preparation for several perilous high entries out of thin air. Instruments were deployed in evocative and often clearly descriptive combinations: Hannah Hammel (piccolo/flute/alto flute), Kamalia Freyling (clarinet), Harrison Honor (percussion), Lauren Hayes (harp), Nathaniel LaNasa, (piano), Emma Zhuang (violin), and Benjamin Francisco (cello), came together as a well-coordinated ensemble under the direction of conducting fellow Gemma New. The Danish Per Nøgȧrd wrote his String Quartet No. 10, subtitled Harvest-Timeless (the name of an autumn crocus), in 2004-5 in close collaboration with the Kroger Quartet. The four Tanglewood fellows―Amy Semes and Edmund Chung, violins, Ye Jin Goo, viola, and John Lee, cello ― assembled for Sunday’s performance, although they cannot have been playing together for very long, were remarkably well coordinated, matching each other’s tone color and articulation with exemplary sensitivity and nuance. Effusive lyricism in the opening section, in which cello pizzicato neatly marked time, led to remote sonic regions (chirping and glissando), then to wide expressive lines interrupted by fragmentary gestures. Increasing motivic activity hinted at an impending climactic moment, only to vanish mysteriously into no-sound-at-all. Long associated with Tanglewood as fellow, teacher, and conductor, Oliver Knussen died on July 8th at the age of 66. One of the most influential British composers of his generation, Knussen conducted the London Symphony in his own First Symphony at age 15, and at 18 studied at Tanglewood with Gunther Schuller. Always a champion of the music of his colleagues and students, Knussen supervised new music activities at Tanglewood from 1986 to 1993. His Reflection for violin and piano was first performed at Birmingham, England in 2016; the performance on Sunday morning by violinist Jacob Schafer of the New Fromm Players and pianist and TMC fellow Danny Zelibor constituted its American premiere. Knussen’s publisher, Faber Music, quotes him as stating that the main melody began “as a response to Gauguin’s painting of a Breton woman swimming, and there is also, perhaps, an echo of the lonely underwater world of an ondine, eventually breaking the surface at the end of the piece.” Playing alone, the violin opened the first section in an ecstatically lyrical sweep, which was answered in muffled tones by the piano. In the second section, the violin began at low pitch as if “reflecting” its high-pitched opening. The piano became a much more active partner in the final section, the two players mirroring each other in a magical evocation of watery reflections — a truly memorable performance of an exquisite work. György Kurtág’s Officium breve in memoriam Andreæ Szervánsky rounded out the show. In 1959, Szervánsky (1911-77), a communist, had defied the party line by adopting Schoenbergian 12-tone techniques as reinterpreted by Webern, and encouraged other Hungarian composers to follow a similar path. Composed as a string quartet some 12 years after Szervánsky’s death and nearly as long after his own second quartet, Kurtág himself (as cited in Matthew Mendez’s explanation in the handout), has called his Officium breve ”a kind of requiem,” a tribute not only to Szervánsky but also to Webern and perhaps also Bartók as well. Although the work is textless, in choosing the title Officium breve for the quartet’s 15 brief movements Kurtág refers to the ancient, yet timeless, Roman Catholic Office for the Dead, which celebrates not only the passing of a single soul but the passing of time itself. In the opening Largo, barely a minute long, open fifths in the cello outlined an indeterminate musical space that was filled in by the remaining instruments and finally defined rhythmically by pizzicati in the cello. Fleeting memories in contrasting tempi included a fantasy on the distilled harmonies of Webern’s canon, a new canon for all four players, two citations from Webern’s Cantata Op. 31, an allusion to the musical gesture “Es muss sein” in Beethoven’s final quartet, Op. 135, a wild “Dies irae” (in Kurtág’s words), and a final resolution in the concluding homage to Szervánsky: a brief quotation of his deeply expressive Arioso in C Major. The festival’s final concert on Monday evening brought the entire Tanglewood Music Center Orchestra onto the Ozawa Hall stage in a series of outstanding performances. In place of the originally scheduled Thus Saw St. John by Poul Ruders, a further tribute to Oliver Knussen was programmed with the performance of excerpts from his Where the Wild Things Are. In another (unannounced) change, Gerald Barry’s Diner moved from the opening of the second half to become the curtain raiser for the entire program. Barry’s title refers, he has said, “to those haunting night paintings by [Edward] Hopper of people in diners.” Equally important as inspiration were the abstract paintings of Mark Rothko. Based on two dances from a 1980 ballet commissioned by the Bremen City Ballet, Diner opens with a raucous can-can, its frenetic but tightly rhythmic repeated brass fanfares juxtaposed with a contrasting sound-scape of muted horns and trumpets. More contrast ― stylistic as well as rhythmic ― arrived with the waltz theme, pushed beyond its pseudo-genteel origins to a bombastic climax. Conducting Fellow Gemma New led the ensemble in vigorously upbeat style, eliciting precisely defined planes of sound from the players. In Seven Days, a wordless oratorio on the creation myth by Thomas Adès in the form of a Concerto for Piano and Orchestra, was commissioned by the Southwark Centre and the Los Angeles Philharmonic, and premiered at the Royal Festival Hall in 2008. (An optional accompanying video by Tal Rosner was not shown in Monday’s performance.) Adès conducted the piece himself on Monday, collaborating with the brilliant pianist Kirill Gerstein as soloist. Adès’s engaged and animated conducting style was reciprocated by the large orchestra, no mean feat considering the constant shifts of tempo, dynamics, and musical material within and across movements. “Chaos–Light–Dark” opened tentatively in the strings alone, followed by a dissonant outburst in the brasses; a climactic chord heralded the entry of the jazzy piano. Dark rumblings in the brasses gave way to the “Separation of the Waters into Sea and Sky.” Progression from low to high evoked the growth of “Land―Grass—Trees,” and brilliant piano figuration, especially in the upper registers, came to the fore in “Stars―Sun―Moon.” “Creatures of the Sea and Sky” began low with muted trumpets before a fugue theme entered in flute and piccolo, moving downward through the orchestra before continuing in the piano in “Creatures of the Land.” The final movement, “Contemplation,” ended as the first one began — with strings alone, highlighting the cyclical nature of this brilliant work and indeed of the creation story itself. As an encore, Gerstein offered Adès’s Mazurka No. 2, a rollicking work of virtuosic pianism recalling the style and figuration of the solo sections of the concerto just performed. In his best known work, Where the Wild Things Are, Oliver Knussen collaborated with Maurice Sendak to create a one-act opera based on Sendak’s marvelous picture book, a strange and fantastic vision of the boy Max’s anger and fear when he misbehaves and is sent to bed without his supper. Knussen and Sendak produced several versions of the opera between 1979 and 1982; in 1981 Knussen extracted from it an orchestral song-cycle for soprano and orchestra which he called Songs and a Sea-Interlude. The scoring calls for winds, horns, trombones, a large complement of colorful percussion instruments, a wind machine, whip, piano with two players, harp, and strings. Although echoes of Ravel and Debussy sound in the distance, the dark brooding of Alban Berg’s Wozzeck and the clangor of Mussorgsky’s Boris Godunov hover over the tale. The low brass chords and clanging bells of the opening hark back to Mussorgsky’s Coronation Scene, and signal that this “children’s story” is no nursery idyll Max’s four songs were assigned to two sopranos. Alexandra Smither’s high bright voice embodied Max’s shrill ravings to perfection; Elena Villalon’s somewhat warmer voice brought a mellifluous tone to the final “Night Song” in which Max’s bravado fades as he dreams of home. Stefan Asbury, head of the Tanglewood Music Center’s conducting program, led the orchestra with the fine attention to nuance and detail this multi-faceted music requires. The culminating work, Symphony No. 3 by Witold Lutosławski (1913-1994), begun in 1977 and completed in 1983, dates from a crucial period in Polish history that saw the imposition of martial law and the rise of Lech Wałęsa’s Solidarity movement. Scored for full orchestra with a large and varied percussion section along with celesta and four-hand piano, it is notable for its kaleidoscopic melding of diverse planes of sound that move the action forward while avoiding traditional symphonic development. After an opening “announcement” of strident repeated notes, the introductory movement was laid out in three episodes, contrasting the colors and textures of winds and brass, and pizzicato and bowed strings, with sharply articulated percussion. A sense of menace and conflict dominated the “main” movement, as contrapuntal interaction between violins and violas, the insistent rhythm of pizzicato cellos, and interruptions from the tubular bells that seemed to warn of impending doom moved the action forward toward a shrill cacophony of strings and trumpets. Recitative-like passages in the strings introduced the final section, leading to a mournful dirge for strings and timpani. As the momentum died down, a new vista opened on an expressive Adagio, only to be overtaken by an accelerated coda dominated by high-pitched percussion and brass followed by a return to the single unison blast with which the symphony began. The Tanglewood audience was visibly moved by this performance, expressing recognition of the emotional power not only of the work of a master composer but also of the high-level musicianship and devotion of the Tanglewood orchestra and its conductor. Thomas Adès and the players clearly revered this music, and wanted us to experience it with them. What better way to conclude several days of intense listening in the serene ambience of Ozawa Hall?